Three races of people--the main "people", the Dorids and the Giants--inhabit one of the moors of England, one race underground, one in the waters and the other with their roads and houses. With family relationships, magic and adventure, this story explores family and community ties and tackles the pitfalls of making assumptions about others. Share your Power of Three love today! Ah, the bad covers on Power of Three. They are really quite awful. I love that the Giants are humans! 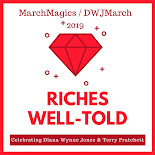 Oh Diana Wynne Jones. She's so great. That bottom one creeps me out but when I went searching for covers, there weren't many appealing choices! The copy I have has just the creepy eyes and no kids at the bottom which makes even less sense. This isn't one of those book titles that really stands out so I could totally see being unsure. But, I have to say that I've never seen that cover in person either but it felt familiar to me as well. Maybe it's just because it's so St. Patricky or something? I thought I had read this and hadn't liked it so much, but upon reading everyone's reviews I find have no memory of this plot, so maybe it was an entirely different book that I didn't like! Another DWJ book I haven't read: yay! That's good news -- and too bad that you thought you didn't like it. Hopefully it really is one that you haven't read! Talking of Power of Three covers, I think the sixth/last one of this page is rather atmospheric and cool. I'd never seen it before. 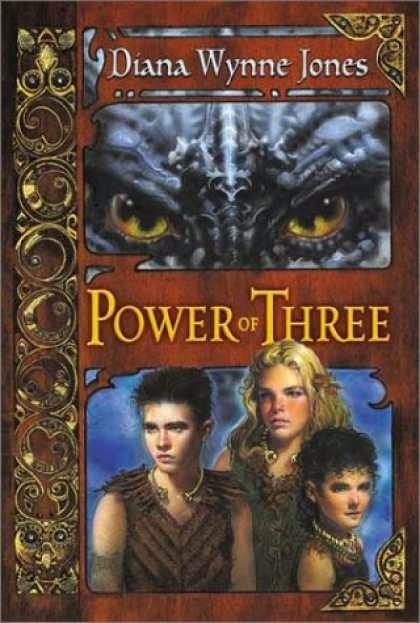 Turns out I have never read Power of Three before, and I love it! DWJ is so good at understanding human psychology, all the influences that come together to make us think and act the way we do. And she manages to explain how everyone is thinking and feeling without ever sounding like she telling us that they're thinking and feeling. If that makes any sense. It totally makes sense. When I read it, I was totally on board with the characters' viewpoints all through the story, even as they changed, because they were absolutely convincing.